Photos users still exploring the new features on their Macs should not overlook the addition of Memories to their iPhones. In some ways, the mobile version surpasses the desktop experience. What makes sense about Memories on an iPhone is that it's the perfect device to share our experiences with others. And the ability to enhance a handful of images by creating professional looking slideshows with just a tap on the screen elevates the entire presentation. Test it for yourself right now. 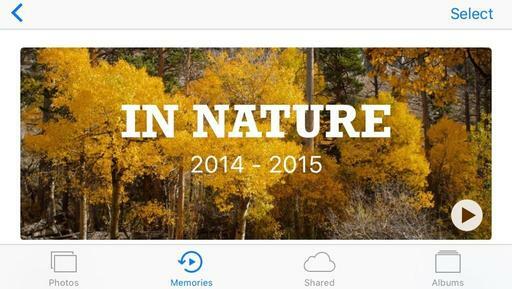 Tap on the Memories button at the bottom of the Photos interface and turn your device to sideways to landscape mode. Tap the play button in the right corner, and Photos will build a slideshow based on the images in that Memory and start playing it. Terrific. But you can step in and fine tune the presentation. Tap on the screen again to reveal the controls, as shown below. Directly beneath the image appears a row of themes you can choose from, things like Sentimental, Gentle, and Chill. And if you have enough slides, right below that is a second row that lists three durations, Short, Medium, and Long. So depending on the mood that you want to convey, and the amount of time your viewer has, you can reconfigure the presentation with just two taps on the screen. For even more control, tap on the Adjustments icon in the upper left corner. Now you have additional editing options for the title, music, duration, and specific images included in the slideshow. Tap Done once you've made your changes. You can share the presentation beyond your iPhone by tapping the Share button at the top of the screen. All of the usual suspects are available, including Facebook, YouTube, and Vimeo. I recommend building your Memories on the desktop version of Photos for macOS. It's easier than working on the phone, and everything is instantly shared via iCloud anyway. But when it's time to show off the pictures, design the presentation on the fly for your viewer, then blow their socks off. It really is impressive. There are quite a few big features in Photos for macOS Sierra, but one of my favorite small adjustments is the return of Places, now debuting as an application album alongside People, Favorite Memories, Last Import, and such. Since the iPhone handles geotagging for us automatically, photographers who use their smartphone regularly have a thumbnail tapestry of their journeys awaiting them, with each location plotted out on a map. Click on any of those thumbnails, and pictures from that location pop on to your screen. It's so simple, really. If you want to see all of your vacation shots from Hawaii over the years, you could build a Smart Album with various conditions covering the appropriate metadata, or your could quickly go to Places and click on the thumbnail over Hawaii on the map. Instantly all of your shots from that location appear on the screen. Want to fine tune your search to a specific location in Hawaii? Simply zoom in by using the "+" icon in the lower right corner of the map, or by pinching outward on a trackpad, to reveal various spots on the island that you visited. Now click on any of those thumbnails to see that smaller group of pictures. This system does not require descriptions, titles, keywords, and any other user-added metadata. Just let the iPhone (or in my case the Olympus TG-4 also) capture the location information, then use the Places album to find the shots you want. 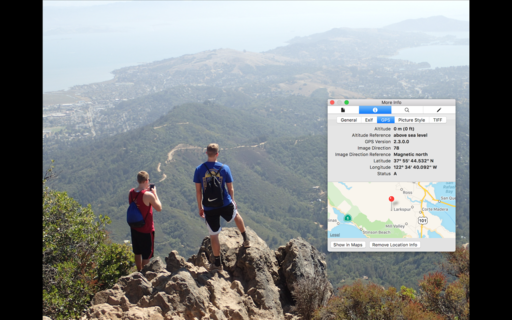 If you're recording geodata with an iPhone and/or a camera such as the Olympus TG-4, then you have some handy viewing options built right in to macOS. "Atop Mt. Tamalpais," The GPS tab in Get Info for the Preview app. Captured with an Olympus TG-4. Image by Derrick Story. 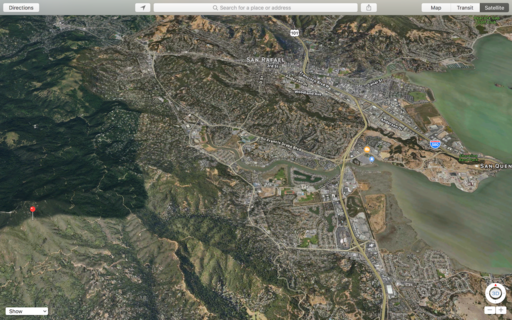 I catalog most of these images in Photos for macOS, which does show some basic geodata. But I really like the view in Preview using the More Info heads up display (Command-I). The GPS tab is more detailed than Photos, and you can click on the Show in Maps button for a terrific Satellite view with labels. The Satellite view in Maps with labels showing. Now one handy thing you can do in Photos is add a location pin to a picture, then export it and view in Preview and Maps. Do this in Photos by clicking on Assign a Location in the Info box and start typing where the image was captured. Photos will offer you locations. Choose the right one, and the tag will be assigned to the picture. When you export the picture from Photos, be sure that the Location Information box is checked in the Export dialog. That will ensure the data travels with the image. Then you can view in Preview and Maps just like a picture that was geotagged with a camera. Get it for $15 using checkout code APPLE15! Despite being a diehard Capture One user, I prefer quick portrait retouches in Photos for macOS. Why? (That's crazy, right?) Well, actually it's not, and I'll explain why here. As you're probably suspecting right now, the key to this workflow is the editing extension functionality in Photos. In this case, I rely primarily on BeFunky and Pixelmator Retouch. Both have a variety of brushes, including soften, that makes it easy to apply basic improvements to a portrait. Here's a movie where I show you how I use a soften brush to minimize sunburn lines. Other helpful tools include tooth whitening, eye brighting, skin tone, and of course, cloning. These are the common adjustments that I need for my people shots. And I have them right here in Photos. Then, once I finish an image, it automatically propagates to all of my other computers and devices via iCloud. So the updated image appears on my iPhone, for example, and is ready to share with the world. This is a terrific workflow, especially for your personal work. 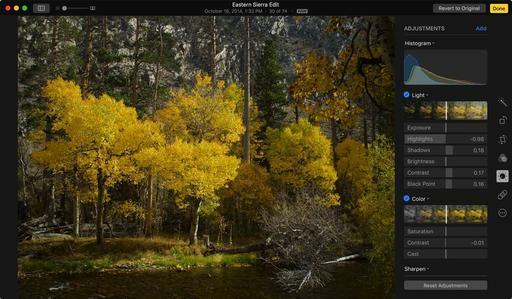 Photos for macOS can do so much more than many photographers realize. And to show you just how powerful it can be, I've just published Photos for OS X: Extensions for Local Adjustments. In this title, I take a deep dive into six editing extensions that provide local adjustments, letting you work on just part of the photo (in addition to easy to use presets and other goodies they include). 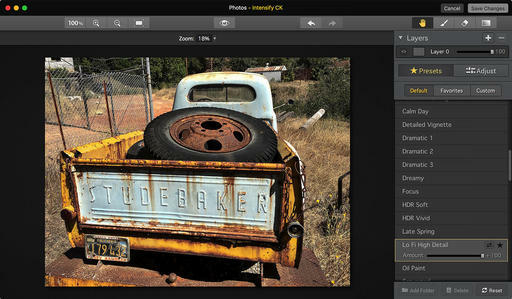 The extensions I feature are: Color Filters, Filters for Photos, Tonality, Snapheal, and BeFunky. Plus, I fire up External Editors and roundtrip with Photoshop and Exposure X, all from within Photos for macOS, and all totally non-destructive. 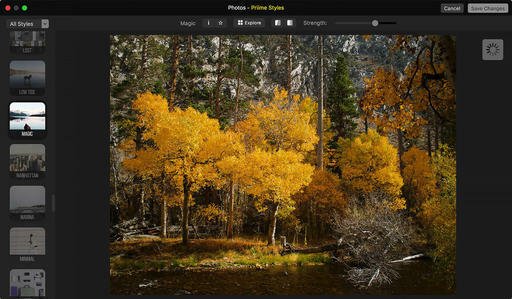 If you're a Photos user, or if you want to see the real potential of this image management app for Mac users, then take a look at the free welcome movie that provides an overview of the course. As I talked about in this week's TDS podcast, the Olympus TG-4 is my favorite tough camera. It captures wonderful images in all conditions, including underwater, captures in RAW, and has built-in WiFi and GPS. The geotagging is what I want to cover today. The GPS function in the TG-4 works quite well. It requires less than a minute to acknowledge a new location so it can add it to an image. My experience has been that if I pull it out of my pocket, turn it on, and start taking pictures, the first image might not be geotagged, but the subsequent pictures are. An easy way to check the status of the GPS is to press the Info button a couple times to bring up the readouts. If you see the GPS coordinates in the upper right, as in the illustration above, then you're probably in good shape. If not, you can tell the TG-4 to update by pressing the OK button. I upload the Jpegs via WiFi to my iPhone 6S or iPad mini (I can get the RAWs later if I need them.) I like using O.I. Share for this. Plus it lets me know if there are geotags for the images via a cute little satellite icon. Those files are automatically added to my iCloud library, which means they are now on all of my Apple devices, including Photos for macOS on the MacBook laptop. From this point, I can build Smart Albums for the geotagged images, view them on a map by using Get Info for a single image, or by clicking on the general location name in the Moments view to see where an entire group of shots are plotted. Thanks to geotagging by the TG-4, I don't have to rely on my memory to recall where I took a particular shot. And when I'm traveling, this is a wonderful benefit. Sidenote: a terrific iOS app for viewing and adjusting metadata for tagged images is Metapho in the App Store. If you're not an Apple developer, but would like a first look at the new features in macOS Sierra, the public beta is now available. You can also help Apple fine-tune the OS for its final release this coming Fall. The usual rules apply here. You need to enroll in the program, backup your computer, and install the software. You don't want to use a mission critical machine for testing the beta OS. That being said, this program is terrific for folks like me who need to start exploring parts of the OS for writing and projects. I'm going to be looking closely at the next version of Photos (lots of exciting new goodies in there). And if you'd rather not go beta, stay tuned here. I'll be reporting on bits and bobs that I discover during my testing. Sometimes when I look at a shot, I think to myself: "I like it, but it needs something." If I'm working in Photos for macOS, that something can be Intensify by Macphun. The reason why I like Intensify is because it's a different approach to image enhancement than HDR. Intensify uses a combination of pro contrast, structure, and detail boost to "bring the image forward." The best way to start is to peruse the presets listed on the right side of the interface, then fine tune your selection with the Adjust tools. You also have options for working in layers and localized work. Once you've tuned the shot, click on the Save Changes button, and you're returned to Photos. The process is totally non-destructive. You can revert to original at any time, or view the previous version by pressing the M key while in Edit mode. I've been working with the Priime Styles editing extension for Photos for macOS. I've applied its filters to my iPhone Jpegs and RAWs from my Micro Four Thirds cameras, and I've had some excellent results. The iPhone workflow is straightforward. You open the image in Priime, choose from their vast array of professional filters, and save. But in order to get the most out of the RAW workflow, I have a few tips. Duplicate your RAW file in Photos, then edit it using native tools first. Images by Derrick Story. Priime Styles can import your RAW file, but it returns a Jpeg to your Photos library. My recommendation is to duplicate the RAW in Photos, then apply your basic adjustments while it's still in the RAW state. This gives you much better control over recovering highlights and opening up shadows. Once your RAW has received its basic adjustments, you can send it over to Priime Styles for finishing. There are lots of filters to choose from. And this part of the process is really fun. All you have to do is click on the thumbnail to apply a filter. Load the edited RAW file into Priime Styles and apply your favorite filter. Now click the Save Changes button, and a Jpeg will be returned to your Photos library, right next to the original RAW. You have all of the standard options at this point, such as viewing the master (press the M key) or reverting to the original RAW file. When working in Priime Styles, I like to start with the Explore button to view thumbnails of all the possibilities for my image. 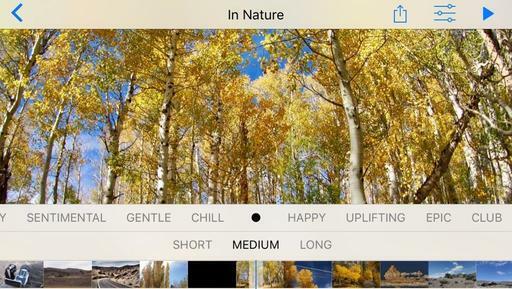 Once I choose a filter, I generally use the strength slider to adjust the intensity. You have two different comparison buttons so you can really get a feel for the before and after. This editing extension is very easy to use, and it provides a wealth of options for your pictures. I've been printing fine art greeting cards for years. 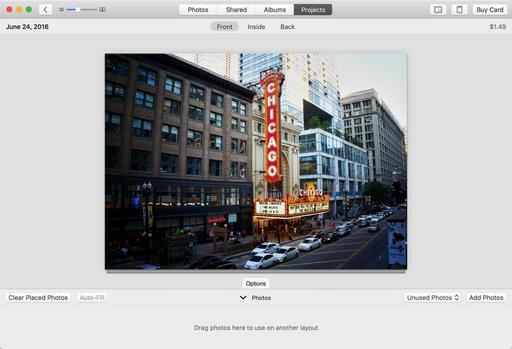 But the process has never been easier than lately using Apple's Photos app. In addition to integrating these projects with my overall Photos library, I have dozens of stylish templates to choose from. And since Photos saves each card that I make as a project, I can easily reopen it, reprint it, or change the photo all together. I write about this process in my latest book, The Apple Photos Book for Photographers, which you can download right now. But I'll also share the basic steps right here so you can create your own works of art at home with an inkjet printer. For this project I'm using one of my favorites, 60 lb. Polar Matte double-sided 7" × 10" (catalog #1958). It's a bright paper with a nice tooth that feels good in the hands. Your cards will look and feel like works of art. 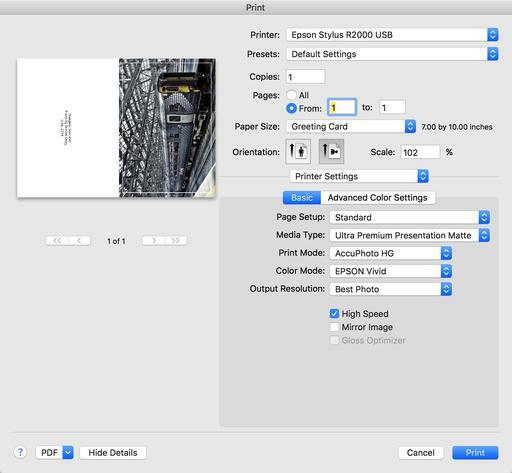 The reason why you want to go with 7" × 10" paper is because it folds down to a standard 5" × 7" card - the same dimensions that Apple uses for its folded pieces. In a pinch, you could cut down a larger sheet if necessary. But the Red River cards are also scored in the middle, which makes folding so much easier and professional looking. As for printing instructions, I'll remind you that what appears in the dialog box is based on the print driver. So what you see on your computer might look different than what I'm showing here. Hopefully, you'll be able to take this information and adjust accordingly. Instead of clicking on the Buy Card button, go to File > Print. You should see something like in the figure above. If you're seeing far less information on your computer, click on the Show Details button at the bottom of the dialog. That should expand the dialog box. Since I'm only printing the outside of the card (I like to leave the inside blank for a personal message), I choose "Print from 1 to 1." Then we get to paper size. Chances are very good that you're not going to have a 7" × 10" option in this popup menu. But what you will have there is a Manage Custom Sizes option at the bottom. Choose that, and make your own preset. I named mine Greeting Card. The computer will remember the 7" × 10" preset you just created. So you only have to do this the first time. After you have the paper size right, the card should look pretty good in the preview window. Mine came up just a tad short on the edges. So I set scale for 102 percent. That fixed the problem perfectly. Now all that's left are the printer settings. You can add those in the popup that's labeled Layout. Click on it, and choose Printer Settings from the list. The most important part is having Media Type set correctly. In my case, the printer needs to know that I'm using matte paper. Check your settings one more time, then print! Watching the card slowly emerge from the printer is the closest thing we have in digital photography to seeing an image magically appear in a tray of developer. Both are exciting. Let the card cure for an hour or so at room temperature before folding - that is, unless it's one of those emergency jobs you're making as you head out the door to an anniversary party. Then fold and go! As you're sitting there in the car with the card in your hand, you might feel a little something. Let it wash over you and enjoy it. That's the feeling of being an artist.